Well is was about to happen soon enough. Found this posted on the TCO Fly Fishing web site. 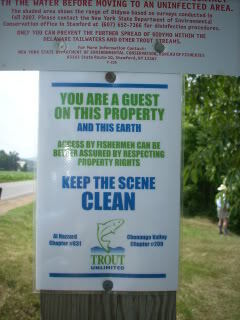 ANGLERS VISITING OUR AREA.........SPECIFICALLLY THOSE OF YOU WHO HAVE JUST FISHED THE DELAWARE RIVER (OR OTHER STREAMS IN NY'S CATSKILL REGION) OR MARYLAND'S GUNPOWDER, PLEASE CLEAN YOUR BOOTS AND WADER WITH A DILUTED BLEACH SOLUTION, OR HOT WATER (OVER 140 DEGREES f) AND LAUNDRY DETERGENT--IT MUST SOAK FOR AT LEAST A HALF HOUR. DIDYMO HAS BEEN IDENTIFIED IN THESE WATERSHEDS. Or even better yet, get a second pair of boots and waders to wear only in infected waters. It's the only sure way not to spread Didymo. .............BE RESPONSIBLE-DONT SPREAD DIDYMO TO THE insert stream name here!! 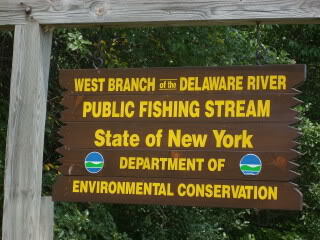 Just hope people who fish the Delaware River system don't spread it to the rest of the Northeast. Closing the Delaware system to all outdoor activities may be our only alternative. You know that all 100% of the fishermen who fish it won't clean their boots. It only takes one to ruin it for the rest of us. back in the car and left. Nice looking water, but not worth the risk. for fishing the Delaware River? Great way for them to protect their famed waters. to stop the spread of DIDYMO to other streams. That middle sign says "Please disinfect all equipment coming in contact with the water...". I wonder how many "disinfect" their boats, rods, reels, line, flys, etc.??? Will it spread...? Most likely. In Maine a good number of years ago they had banned the use of sea planes to prevent the spread of invasive species in lakes and ponds. Hey it never hurts to try but as someone else has posted there have been literally thousands of folks that have been tromping thru this crap for a couple of years. My first time seeing it was last year on the Delaware. I found out I was wading in it after I asked my guide what the hell it was after working about a 50 yard section of the D casting to a pod of fish. I threw out the boots but If I hadnt asked I might have taken that crap to another stream in PA I fished on the way home. I doubt very few would follow your example. BZ. CTobias (leaving his CP rig home) and I depart May 14th. Looking to hit one of TU's top streams the South Holston River on the way down on the on the 15th. TroutFest in Townsend on the 16th. There are only two stream that I do want to fish. Want to bring Christopher a mile or two up past the roadway to fish Greenbrier (Middle Prong of the Little Pigeon River). Plunge pool after plunge pool after plunge pool. A sight to behold and unbelievable fishing experience. The other would be the Straight Fork over in NC. After that, any place he wants to try is fine with me.. as long as we are fishing in a Smoky Mountain stream.. who cares which one! 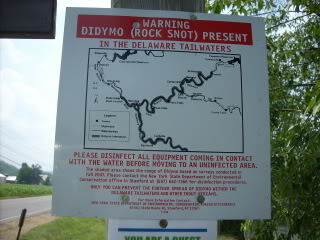 In addition to the Delaware system, rock snot is now present in Esopus Creek. Good luck in the Smokies. Should be a blast. Questions for some the experts on this subject. 1) Yes I could understand about felt boots, but isn't didymo also spread with contact on waders, neoprene and any other material that it could stick to. 2) didymo is also spread by water fowl and can spread easily from stream to stream. So what's the game plan here? 3) Yes using bleach will kill the virus, but over prolonged period of time and numerous fisherman doing this, what is the ramafication if any of bleach now being introduced into the stream? How many fisherman due you know are going to rinse there boots off or even try and clean there boots at all. So these are just a few questions from an angler. What do the biologist have to say on this subject?